The end of our winter session is usually marked by the Awards Dinner, arranged by Mary Nicholson. This was held at the Cathedral Restaurant and was a very enjoyable evening, with excellent food in a pleasant setting and nicely served. 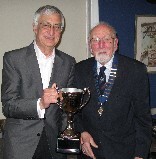 The highlight was the presentation of the awards to the successful members in the annual competitions. This was done by the president, Ken Walters, assisted by Mary Nicholson. The pictures show the diners at the event and some of the winners.